Highway departments and commercial sign shops across North America specify overlaid plywood panels for signs because they carry the message clearly, deliver the structural properties required of large sign installations and are highly resistant to vandalism and theft. The unique demands of sign construction also require a superior surface that resists peeling, makes for easy application of reflective materials and provides high resistance to edge splitting, slivering and delamination. APA trademarked High and Medium Density Overlay (HDO and MDO) plywood effectively combine the toughness of wood structural panels and the superior wear of an overlaid surface. These features place HDO and MDO among the most durable construction materials for signs on the market today. They are ideal in size, strength, weight, dimensional stability and rack resistance. In addition, panels are easy to use, requiring no special machinery or roll systems. With plywood as the base material, these panels fabricate and install easily, and are resistant to changing temperatures and the effects of moisture. They boast high impact resistance, are readily available and incur low repair and maintenance costs. Overlaid panels also rate high in aesthetic appearance and their use is environmentally friendly. This publication describes High Density Overlay (HDO) and Medium Density Overlay (MDO) plywood applications, properties and characteristics, plus shop practice and finishing recommendations. Demanding applications such as concrete forming, exterior siding, and industrial containers require tough building materials. The features of HDO and MDO place them among the most durable construction materials on the market today. 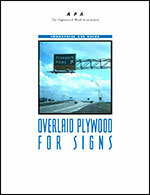 This publication describes how to specify MDO and HDO plywood for sign fabrication and provides design details including fastener selection , wind loads, and bracing. Where do I find APA-trademarked products for sign applications? APA-member manufacturers are located throughout North America. Hundreds of distribution centers throughout the US and Canada inventory a wide selection of products for signage applications. Industrial users can rely on a consistent source of readily available, quality products. Find APA members that make products for the sign industry. Yes, many APA-member manufacturers can make custom products for your unique applications. Find APA members that make custom products. It is important to understand that the term Structural I refers to certain specialized strength and stiffness characteristics of plywood and OSB panels while the term Exposure 1 refers to the glue bond durability of a plywood or OSB panel. Is CDX an Exterior grade? APA Rated Plywood Sheathing Exposure 1, commonly called “CDX” in the trade, is sometimes mistaken as an Exterior plywood panel and incorrectly used in applications for which it does not possess the required resistance to weather. “CDX” is manufactured with a C grade veneer on the face and a D grade veneer on the back. D grade veneers are not suitable for Exterior applications should only be used for applications as outlined under Exposure 1 above. For sheathing grade panels that will be exposed long-term to weather, specify APA Rated Sheathing Exterior (C-C Exterior plywood under PS 1)..
For more information, please refer to Technical Topics: Bond Classification, Form TT-009, available for free PDF download from the APA Publications Library. 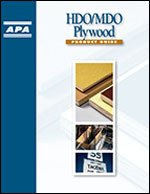 APA-trademarked plywood and OSB panels are manufactured to stringent product standards (such as Voluntary Product Standard, PS 1-09, Structural Plywood and Voluntary Product Standard, PS 2-10, Performance Standard for Wood-Based Structural-Use Panels) and under the most rigorous, state-of-the-art quality assurance programs in North America, the APA quality services programs. 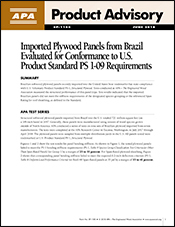 Many imported plywood and OSB panels never undergo product qualification testing. Without such tests it is impossible to determine how the panel will perform for the intended use. As an internationally accredited testing laboratory, APA put imported hardwood plywood panels from China and Brazil up against domestic plywood certified to PS 1. As expected, the import test results indicated inferior mechanical and connection properties, severe failure for bond durability, and only one tested sample would have met the formaldehyde limits imposed by CARB when compared to APA-trademarked plywood. Look for engineered wood panels bearing the APA trademark. It appears only on North American products manufactured by APA members committed to APA's rigorous program of quality inspection and testing.